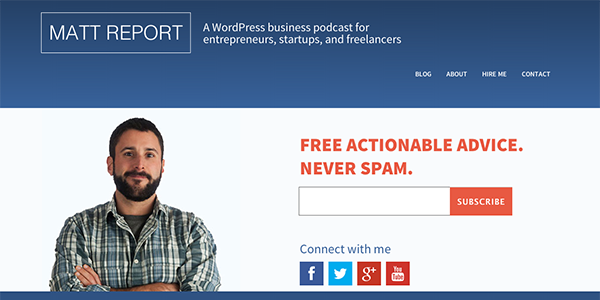 Are You Listening To These Awesome WordPress Podcasts? For casual users and professionals alike it pays to stay up to date on the latest WordPress news, developments, tools, and more. As an open source project with an active developer community, WordPress is constantly in a state of what I fondly refer to as “stable chaos”. Stable because the folks at WordPress.org have created one of the most useful and trusted content management systems in the World, but also chaotic in that constant iteration is at the heart of what makes WordPress great. It requires the whole community to keep up with it and adjust to its updates and innovations. For many of us this is an enjoyable, ongoing learning experience. In my case, I’ve even made a bit of a career out of learning new WordPress related things and explaining them to blog readers like yourself. However, there are other ways to learn about WordPress other than simply inundating yourself with countless WordPress blog articles or living in the WordPress.org documentation. 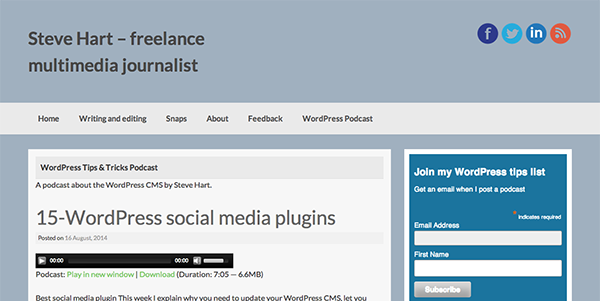 One such resource, which I find to be a nice change of pace now and again, are WordPress Podcasts. That’s why in today’s post I’ve gathered up some of the most popular (and helpful) WordPress podcasts available. They’re perfect for playing in the background while you drive, clean or do whatever. Hopefully you find them as fun and useful as I do! The DradCast is a video podcast featuring Dre Armeda, Brad Williams and a new guest host each week. The basic format of the show is that after pouring a few drinks, they jump into a discussion all things WordPress–from the latest WordPress news, to upcoming events, and the WordPress community in general. 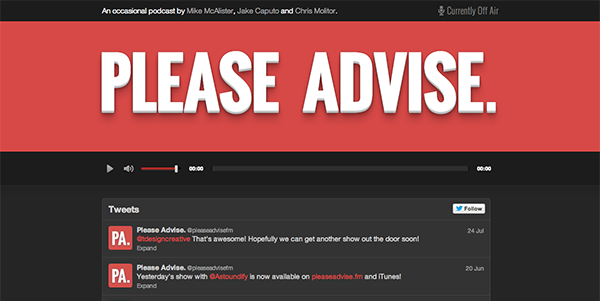 Please Advise is an “occasional” live podcast by Mike McAlister, Jake Caputo and Chris Molitor. As commercial theme developers they have a lot of great advice and information on the theme industry, theme development and WordPress in general. This is a good one to subscribe to and “forget”. If you’re in need of constant content then this won’t be your go to podcast, but every time a new one pops up as ready to download you’ll be pleasantly surprised and know that you’re in for a treat. 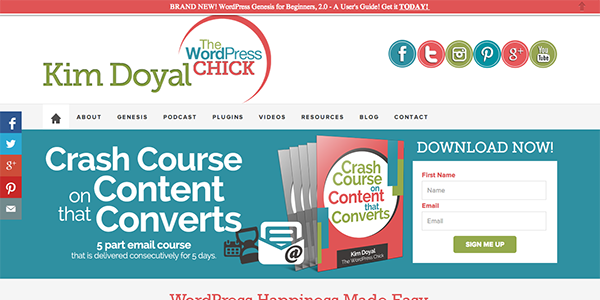 The WordPress Chick is a podcast by Kim Doyal. Her motto is “WordPress Happiness Made Easy” and the podcast delivers a lot of fun and useful information about WordPress themes, plugins, publishing and more. If you want to understand WordPress and how to be successful with it then the WordPress Chick Podcast is what you want to be listening to. 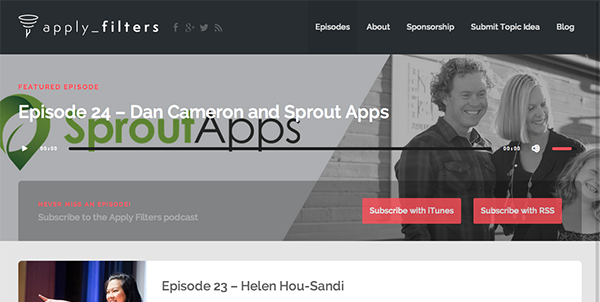 Apply Filters is a great WordPress development podcast created and hosted by Brad Touesnard and Pippin Williamson, both well known code geeks and high profile contributors to the WordPress community. Each episode is both discussion and story based as both Brad and Pippin as well as their guest share their stories and experiences with WordPress development. 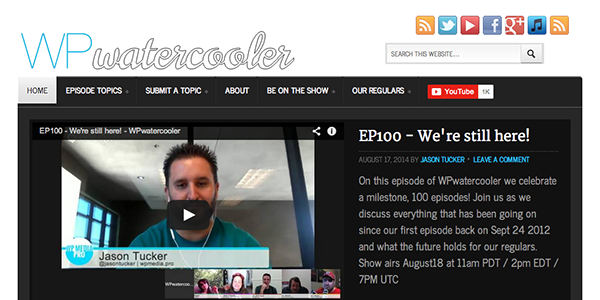 WPWatercooler is a live video-roundtable style discussion hosted by WordPress developer Jason Tucker. It’s a weekly show with the broad goal of discussing the WordPress community and how using WordPress has changed the guests’ lives and businesses. You can expect a lot of shop talk, lively debates, tips and best practices all paired down into about 30 minutes each week. A good weekly dose of new WordPress thoughts and community engagement. WordPress Weekly is a WPTavern podcast recorded live each week at 9:30pm EST on Wednesday night. More than the other podcasts on this list, WordPress Weekly focuses on news with supplemental interviews and discussion. It is hosted by Jeff Chandler. One of the things that makes WordPress so great is the massive collection of free and premium plugins that have been created by and for the WordPress community. Whereas the other podcasts on this list mix things up and include plugins in their lineup to varying degrees, WP Plugins from A to Z, created and hosted by John Overall is dedicated to bringing you all of the WordPress plugins reviews you need in order to find the tools you’re looking for while avoiding the ones that are not worth your time and effort. With over 20,000 WordPress plugins in existence (and more coming out all the time) this is a weekly podcast in no danger of running out of valuable content any time soon. While relatively new compared to some of the other podcasts on this list, WordPress Tips & Tricks by Steve Hart is gaining some popularity and momentum. No doubt thanks to his winning personality and ability to deliver useful content in short bursts. Typically each podcast episode is a 5 minutes or less with some around the 10 minute mark. A great example of a show that sticks to its title and premise while delivering a pleasant experience too. 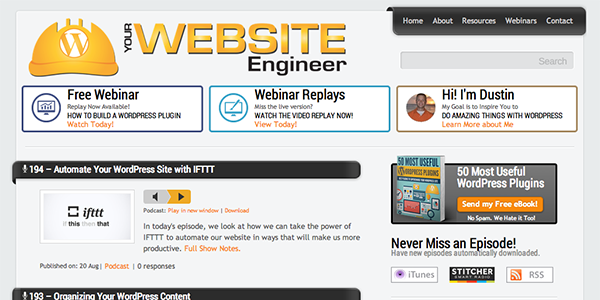 Your WordPress Engineer is a podcast created and hosted by Dustin Hartzler that, each week, provides a simple approach to creating high quality websites with WordPress. His stated goal is to inspire you to do great things with WordPress and each week he tackles a topic that once explained will help you do just that. If you are a small business owner working on your website or someone who regularly creates WordPress websites for small business owners then this podcast is for you. While the above podcasts are my top recommendations based on their popularity within the WordPress community at large, I’ve included a short list below that includes other WordPress related media that, like the podcasts, fall outside of the typical WordPress blogosphere content. WordPress podcasts are a great way to absorb news, updates, trends, tips, discussions and more by simply hitting play on iTunes. If you have found it difficult to stay up to date on all things WordPress maybe putting one or more of these in your commute queue would be a good way to learn more about WordPress without losing time you could be doing something else. I also like to put one of these on while tinkering with my site, cleaning the house or riding my bike. However or whenever you choose to consume your fill of podcast goodness I’m sure this list will prove helpful in supplying the WordPress related content you’re after. Do you have a favorite WordPress podcast? Did I miss any? Tell us all about it in the comments below. Although it is not WordPress focused, there is a great business podcast called The Businessology Show, which talks about value pricing, client acquisition, and a lot of other great stuff for the business side of things. In the shameless promotion department, GoatCloud does a twice monthly or so Hangout (which becomes a podcast available on iTunes and the website) where we talk WordPress, Internet Marketing and how small business copes with technology. It’s sometimes just me, sometimes with a guest. interesting and educational, I will follow some. Do you have any suggestions of where to find tutorials to create my own podcast on my website? Awesome resources. The Elegant Themes Blog never disappoints! Great list! I’ve been looking for some good WordPress podcasts. I know the basics but would like to become more proficient at creating custom designs. For frenchies , you can also listen to : http://veryfrenchtrip-wp.eu/flux/podcast/ WP podcast made by the Very French Team ! Great post, thanks for the sharing thie info. Don’t forget http://kitchensinkwp.com/ weekly podcast, informative and fun! Rebecca Gill posted a great list a week ago. I posted my favorites in June. Good to know about WPCast.fm. Great list. Now able to follow more about wordpress with these. WP Plugins A-Z also has 2 hosts, John Overall and Marcus Couch. The site is actually wppluginsatoz.com, not John’s personal site. Thanks for including the shows! Please be weary on some of those links, for example the author of Lets Build WordPress is giving bad bad information…. He uses Admin as the username and says to not use the randomly generated password because “its too hard to remember” and recommends changing it to something easier..